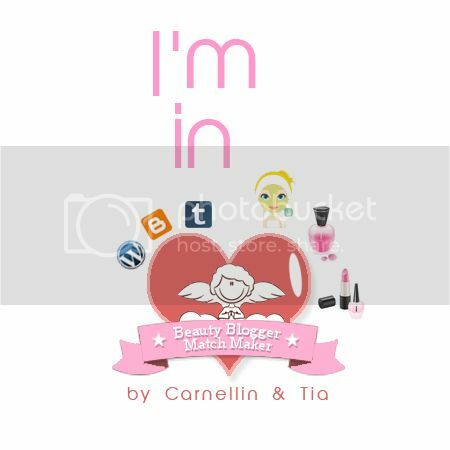 No, it's not about another makeup products or review or an event report. Introduce you, the most adorable and handsome male pomeranian, Jco von Oshin. Jco is my 2nd dog. My 1st dog was also a pomeranian, named Ficy. She's cream coloured and she died peacefully at Christmas night in 2011 cause of distemper. Jco was also suffer with distemper virus when he was 2 months old and he had struggled from the virus. He still survive and alive until today. 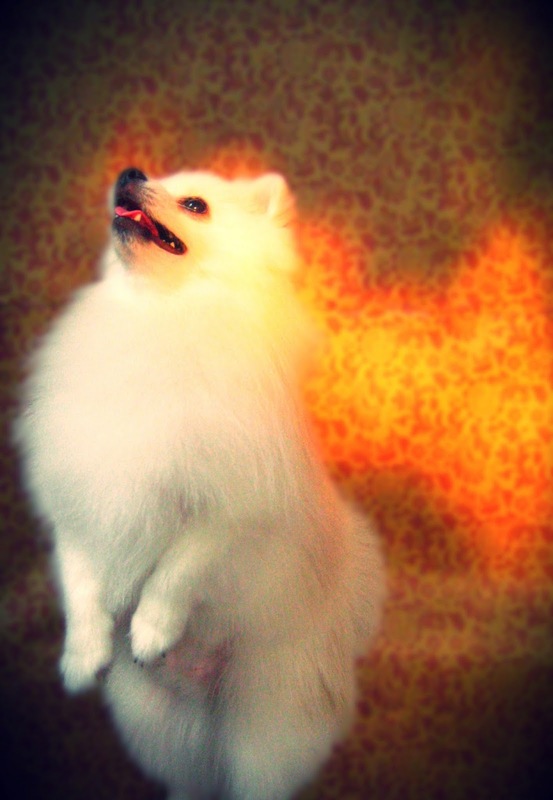 Jco is a white pomeranian dog. He's not snow white, though. Jco can obey some commands (if he wanted to), like sit or stand or take a pee. But sometimes he doesn't obey. It's okay because I don't want to force him do some tricks just to look cute and smart. He's my best friend, my partner, the one who will sit there and listen all my sh*ts without being tired and he's the one who will always wait me at home and happy when he sees me. 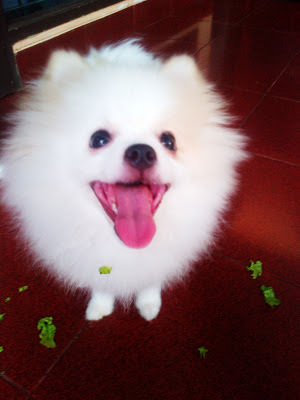 Now, introduce you, the prettiest and most adorable female pomeranian, Celine (Funky Pom's Geisha). 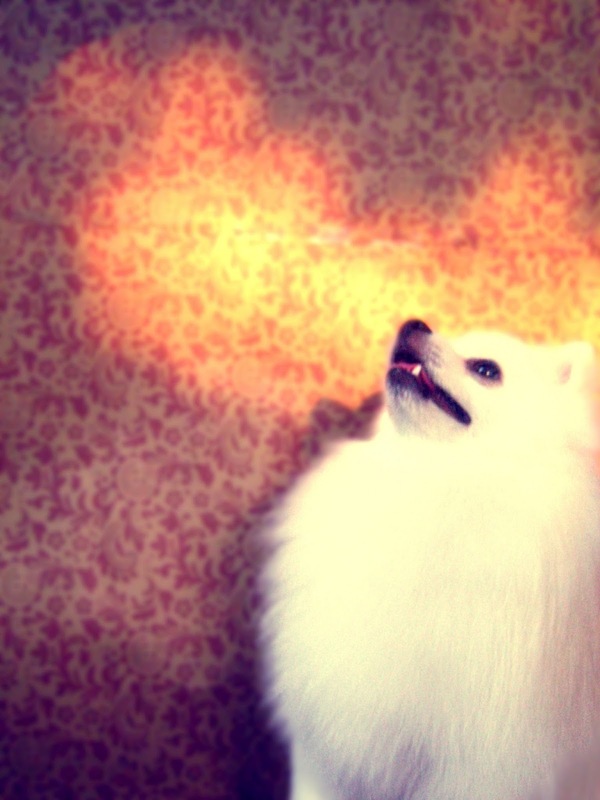 Celine is also a white pomeranian. She's overactive and love to lick everything. She's my mom's favourite. She's more attach with my mom instead of me. Celebrate Jco's 1st Barkday Blast! My dad, mom and me love them so much. 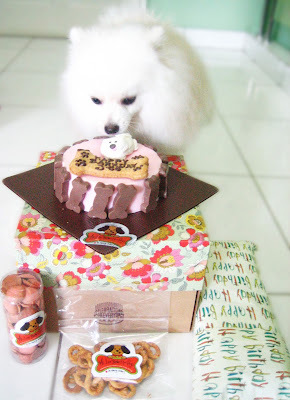 I save money (extra hard) for buying a dog birthday cake for Jco 1st birthday. 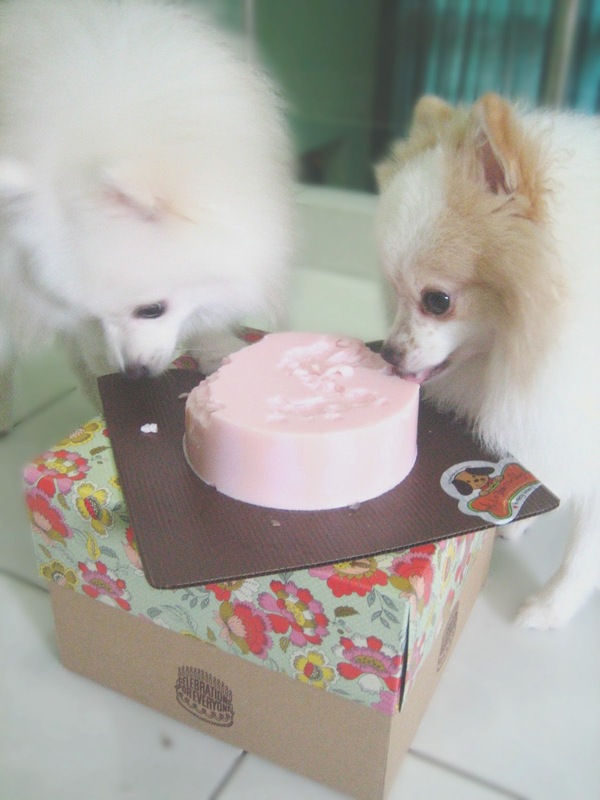 It's worth it in the end :D They both like to eat that ice cream cake for dog. And Celine will also celebrate her next birthday on March. Still a long waiting..
Do you celebrate their birthday like you celebrate your kid's birthday? Ehh lucu amat lg makan kue xD itu kue eskrim nya khusus doggy gitu?